Sitepoint Marketplace is an indispensable website trading point for people who are involved in buying and selling of websites. Sitepoint Watch enhanced website flipping in a more presentable effortless way. 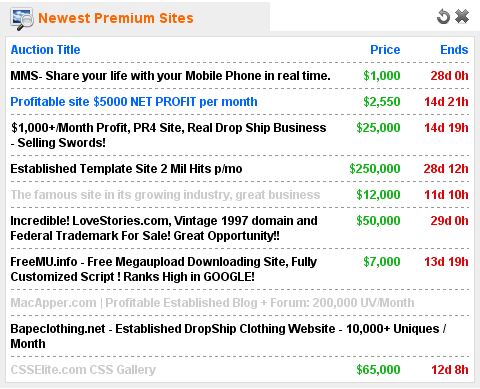 You can have all the newest and ending soon auctions of Sitepoint at a glance. Furthermore, you need not refresh the page to update the newest information. It is a handy website flipping tool for people who would like to monitor website auctions closely. It helps them buying and selling websites easily. This is an awesome tool for domain buying. It’s better that tdnam which only shows godaddy domains. Thanks for the tool. Yes, it is. And you get some nice bargains too. I bought a couple of nice domain names for under $200. Holy, crap! What an amazing resource this is! This is why this website [WebAppers] should be a part of any designer/developers’ resources. Nice tool … a lot of expensive sites though. For cheaper sites I go over to digitalpoint instead. Need the sitepoint tool but its GONE? Can u help i need it bad..
Looks like sitepoint.com took over the URL..